I snagged this 5001 new on Ebay for $150 to replace an AMC CD9 that skipped so much that I finally trashed it, but not before completely dismanteling it for a look see. As luck would have it, I sprung the door on the 5001 and had to take it apart also. (Fixed it myself but not easily). Compared to the CD-9, the Marantz is extremely cheezie looking on the inside, very insubstantial and plasticy compared to the AMC which was extremely heavy and used nothing but audiophile appearing parts. That said, I have to wonder if all of the weight and beefy parts are necessary for decent audio performance. That AMC was really impressive on the inside and to my ears, better sounding than the Marantz with tighter bass and more midrange beef. But...it skipped from the time it was new, big problem! As a side note, the last cd that I listened to on the AMC was Keb Mo and in the sweet spot of my system, so I immediately played the same cd under the same conditions with my new 5001 and was a little dissapointed by the slightly unjointed bass and lack of midrange fullness. Now, back to the Marantz 5001, it's pretty enjoyable really. It definitely sounds more audiophile than not, has nice features including a really great working remote, and it operates quiet, smooth and quick. It might be worth five stars, but I like to be conservative and I would recomment the 5001 to anybody for a listen I don't have the AMC anymore, so can't compare now that the Marantz is broken in. I am happy with the 5001 and that is all that matters. Headphone output with volume control that drives audiophile cans. Cool functions like pitch adjustment, ten second quick replay, text, and peak analysis. Affordable (depending on your perspective). CD tray feels flimsy with up and down play. I've used this CD player in my office for the last three years, at least five hours a day, five days a week. It has excellent measured performance and imparts no sound of its own to recordings. The unit has some heft and feels solidly constructed. Only the disc tray seems a little flimsy. The player has some unique features, including a headphone jack and a pitch adjustment. There's also a nice remote control. Of course, it has digital and analog outs as well. Considering that few to no other manufacturers offer headphone output, this feature alone is worth the price of admission if you frequently use cans. The player easily drives my AKG k601 headphones (120 ohms). There's no need for a separate amplifier, making this a very simple office system! Marantz has now introduced a new version of this player, making the 5001 a great closeout / used buy. It has withstood heavy use in my office, and I expect many more years of service. It's a great CD player for headphone users, or those who just like quality components. Yes, you can spend a lot more for a more durable loading tray, even more pride of ownership, maybe a better warrnaty, etc., but you are not going to get more transparent sound. The measured performance doesn't lie. First of all, I am not an "Audiophile". I do not spend hudreds/thousands for interconnects (I use Monster 500MkIII). My stuff is what is called mid fi: JBL L112s, Adcom GFA 555II amp, and GTP450 Pre/Tuner. I wanted the best CD player I could get within my means, about $300. Read reviews on Cambridge Audi, NAD models at comparable price levels. Reviewers disagreed on those two, but all agreed the Marantz is a great performer, so I chose it. I was currently playing CDs through a Pioneer DV525 (not a bad unit, read the reviews) so I expected an improvement, but not night and day. That is exactly what I got. Having said that, the difference is definitely noticeable. Simply stated, warmer (not as tinny on the highs), bass better defined, easier to listen to for extended periods. Finish and materials are definitely an upgrade over the typical plastic box, more fnctionality that I will ever use. I know there's better, much better, but this player compliments my system very well, and is the best I have heard in the price range. I am very happy with it. I am having my higher end tube model serviced and was curious to find out for myself how this very nice looking and well finished entry level Marantz player compared. When I first listened to the 5001 I perceived the mid range to be on the grainy side. The vocals also sounded too pulled back and too airy. Bass response seemed to extend deep enough but was a bit muddy, not as tight as my tube model. High frequency response and detail was very good, not overly bright like most earlier CD players that I've owned. I had a Rotel RCD-955AX several years back that sounded very nice, but even so in retrospect it was too bright sounding. The Marantz 5001 on the other hand has a surprisingly warm tube like analog sound. I have found over the past few years, since I began upgrading my dedicated audio system, that first impressions do not usually reveal the true characteristics of a component. I don't know if it's just a matter of my ear adjusting to a new piece of equipment, or if it's truly a burn in issue. I am inclined to think that perhaps it is a bit of both. I listened to the 5001 for several days, playing a variety of music from jazz, folk, rock and classical. When I went to bed I would put a disc in and let it play on repeat overnight. After a few days passed my original perception began to change. The player still had an airy tone in the vocals, but now it was more pleasingly airy, and the graininess seemed to smooth itself out. The vocals still a bit pulled back, but not so much as my first impression. Bass seemed to tighten up as well. The soundstage that this unit produces is huge and very realistic. A few classical recordings truly brought this characteristic out, unbelievably close to a live concert in a large hall. Bottom line, I am very impressed with this Marantz cd player. In my opinion it is an excellent choice as an entry level player or for serious audiophiles. It sounds so good after a few weeks of listening that I'm considering selling my tube model and banking the difference. I think a part of it is that this player seems to be a very good match to my vacuum tube integrated amplifier, but I would expect that it would sound very nice through any amplifier. For the price of this unit you can't go wrong....excellent value for an audiophile grade player! No experience with Marantz service, as this is my first experience with any of their components. This was also my first experience with Crutchfield and it was very satisfying. If a problem does arise I get the impression that they will do everything to help get it resolved. 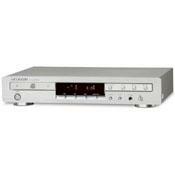 Sounstage improvement, clarity, more neutral presentation than stock entry level dvd/cd players. Has many more cd playing friendly features than would your typical entry level players. Fairly good build quality, attractive unit. Headphone output with its own volume control. This sounds real good and the signal to noise ratio with the headphone output is very good. I tend to use it over the headphone output of the amp, in fact. In all I was surprised at the level of improvements. For this price, pretty happy overall. Good 3 year warranty. On some recordings, it can't seem to tame harsh treble, but maybe this isn't necessarily cause and effect by the cd player. I am using admittedly a budget bookshelf speaker system that I plan to upgrade. There is no doubt better stuff out there, but the next price level for cd players seems to be twice that of the Marantz cd5001. So I'll give it 4 stars for sound quality but definitely 5 on the value-to-price ratio. Hi, I bought the Marantz cd5001 to upgrade from entry level samsung and yamaha dvd-cd players, which had been doing double duty for movies and music. I have it paired with a NAD c325bee integrated amp, playing through Athena asb1 bookshelf speakers and an athena asp400 sub. The biggest difference in moving from a dvd player to the marantz was the soundstage. Hard to describe, but with the dvd players (and assuming you are about 9 feet centered in front of the speakers 6 feet apart), it seemed as if most of the music was being played moreso in front of you, with some variation and placement of instruments a little to the left and right of the center spot, but never to the full extremes of the right and left channels. With the marantz, the whole soundstage spectrum was filled (all the space between the speakers and then some), so that it seemed you could place each instrument, including vocals, more easily. And because of this, the music seemed less "congested" and more airy and spacious. Vocals and words being sung were more clearly articulated and understandable. Compared to the dvd players, I noticed a lot less sibiliance. Lastly, and again this is hard to describe, the music seemed more balanced. With the dvd players, often it was coloured in favour of vocals being over pronounced in the mix. With the marantz, it just seems to sound more balanced and neutral. Yamaha and samsung entry level dvd-cd players, sony mini system which broke down after 3 years. Great CD player. I love it for Jazz, Classical with its built-in headphone amp it makes for a great office system, or a second system. Nice mellow Marantz sound, can listen for hours. I was in the market for a budget audiophile CD player. Before I purchased the Marantz CD5001 player, I auditioned a number of players in its price point and above including NAD, Rotel and Denon. These player produced sound that was appealing, however when I auditioned the Marantz CD5001 what stood out to me was its superior top end. clarity and openness. There was a sense of space between the instruments. Voices project well with naturalness. It has a smooth laid back top end that will not fatigue you with extended listening. Bass is well rounded and tight. Build quality is good. Overall excellent value at its price point. Well worth an audition. Great cd player, tight bass and excellent sound. Solid construccion- I like so much Marantz products. Marantz cd-63 mkII, Rotel rcd951. Given the high-performance sound and build quality, there are none. This CD player is one of the best high-end audio bargains, bar none. The sound is warm, liquid, super-detailed, and holographic. Much like a CDP that costs thousands of dollars. The 24-bit Cirrus Logic chip in this unit sounds phenomenal. In addition, the built-in headphone amp sounds great as well. I am blown-away at how 'hi-res' this unit sounds. The CD5001 gets me so much closer to the music than any previous units did! Performance in all areas. Sound, build quality, looks and value for money. Are you joking? Its not often that a peice of hi fi equiptment at this price totally floors you. This one did! I used to wonder how much more a good CD player could do over a good DVD player. On advice from a techie at Marantz I bought their entry level spinner to go with my SR7500 amp and B&W 603 S3's. I had been using a Yamaha DVD-C750 for music prior to that. I thought because it plays SACD and DVD-A it would do the job. And it was. I just wanted a bit more. Well im stoked at the clarity from this player. Well worth the investment. I now spend more time than I used to in that room. Ive always been a music nut and now I have a great combination of goodies im becoming obsessed. My tastes are hard rock, dance and techno. Probably not what most audiophiles go for, so I can advise that this combination works extreemly well for it. Oh and by the way, try listening with a good set of headphones. That will scare the pants off you. Both my daughter and I heard stuff that we had no idea were on disks. As well as faint music on introductions some bands have a bit of talking etc and this CD player picks it up perfectly and deliveres it perfectly through headphones. Admitidly my headphones are Sonys designed for SACD frequencies. None. Since the DVD revolution I had always spent money on decent DVD players so this is the first CD player ive used since the early 90's.